Farasha based in San Francisco California has created a new style of smartwatch called the SOWATCH which its developments say is the first autonomous smartwatch that is capable of tracking cardiovascular health, blood pressure and is also able to customise your workouts. Watch the promotional video below to learn more about the development, inspiration and features of the SOWATCH which is now available to back via Kickstarter with pledges starting from just $99 for super early bird backers. Imagine a watch that can help you follow your health and vital signals, An intuitive smartwatch able to detect cardiovascular disorders, hypertension, fever, hypothermia, sleep disorders and more. A complete sport-watch able to track your sport activity, motivate you to do more exercices, compare your performances with your friends and prevent injuries and over-training. A useful device which alerts your family or physician, and able to work without your smartphone! An innovative platform, which offers you multitude-training exercises and allows you to prepare and design your own workouts program! This is the SOWATCH! The first smartwatch dedicated to health and sport activity. 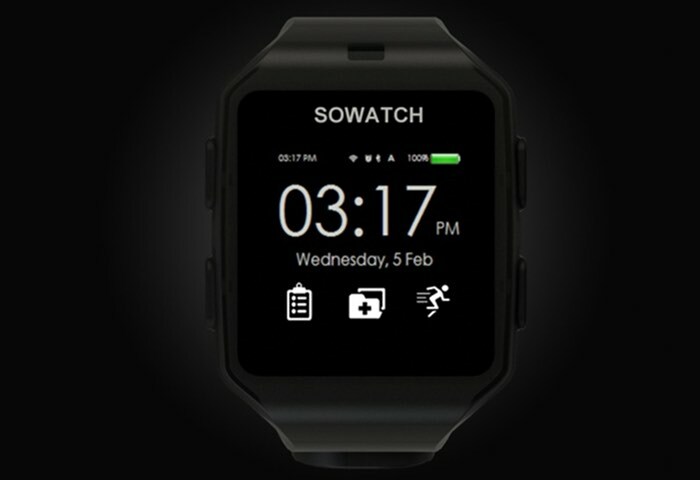 SOWATCH was designed to help you keep an excellent shape and prevent cardiovascular diseases. We have integrated many sensors able to track your physiological parameters. Your heart-beat is also an absolute indication of your body state! We have worked with cardiologists and sport doctors to integrate an algorithm able to record the sound of your heart and draw your cardiovascular activity as a cardiologist do, send records and measurements to our anonymous app as you or your physician can display and analyze them when & where ever you want!